This is the 2-product, dual faucet version of the Beverage-Air BM23 Kegerator. 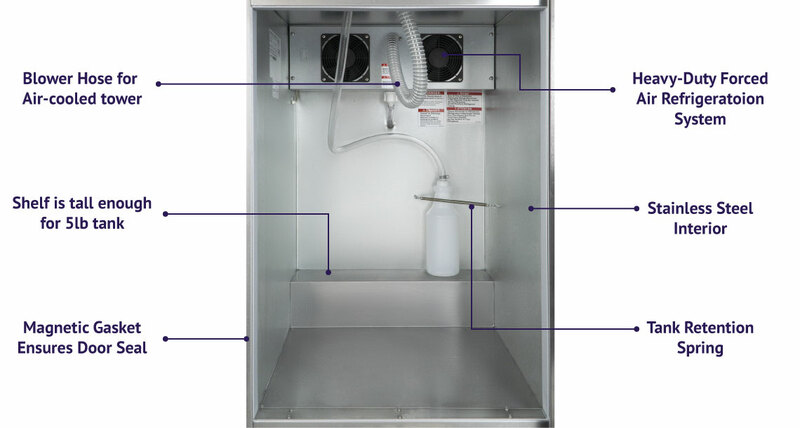 This draft beer refrigerator offers full beer keg capacity, is heavy-duty and has forced air refrigeration - draft beer is dispensed ice cold every time. Standard construction includes wear resistant vinyl on steel exteriors with black the most popular vinyl choice. The top is made from heavy-duty stainless steel including built-in drip tray for easy cleaning. Top rail is standard on all models. Lift-out heavy duty forced-air refrigeration system creates a steady flow of cold air through the complete product load and provides fast uniform recovery and cooling. Refrigerant used is R134a, which is CFC free for full compliance to all environmental concerns. A 6' cord and grounded plug are provided for electrical connection. This two product kegerator comes with a stainless steel 3" diameter double faucet draft tower. The gas hose, beer tubing, washers and clamps are included. You will need to specify your keg coupler set up and add a Co2 tank and regulator. The Beverage-Air BM23 is large enough to store both a full size keg (non- rubber) and up to a 10 lb. Co2 tank. This beer cooler can store three 1/6 barrel kegs or four home brew (5 gallons) tanks. Please feel free to call us if you have any questions. You can easily customize your draft beer parts to dispense the type of beers you plan on pouring. Please call us if you have any questions about all your configuration options. We have set up the order process to ensure that you will not be missing any parts to properly dispense two kegs. This kegerator can fit one Full Size or Pony Keg, up to two Quarter Slim Kegs, and up to three 5 gallon kegs. Comments: I have two of these, and both are dependable and quiet. They can keep the beer cold even in the August sun as the tower is cooled as well. Fan forced cooling is essential for outdoor use and the big wheels are nice for the patio. Only gripe is the drain line hose is short and located in goofy center of drip. Would have been better to slant the drip pan and run the drain line from the hinge side, not in they way then. other than that small issue, great. Comments: Unit is great. Can fit 3 six-stools easily along with CO2 tank. Great for all beer styles and drinkers (I'm somewhat of a beer snob). It is easy to clean as well and does not make too much noise( I read some reviews before purchasing and some said it was really loud). The only issue I had was in the process of getting it from Beveragefactory. First, the company that was suppose to deliver never contacted me to setup deliver (I had to call them). Then, when they delivered it, the door hinge was severely damaged and I had to send it back (beveragefactory did send me a new unit after I sent them pics of the damage and I also received an additional coupler for my troubles). The second unit was much more efficient in getting to me as I think the company (both beveragefactory and the freight company) could sense my displeasure with the first go around. In the end, the unit has worked out as good or better than expected. Lesson to others: stay patient when waiting for it to arrive and check before signing off on deliver. Comments: I have owned two kegerators before this one. The previous ones were low end models and both died after a few years, so I decided to spend the cash and buy a commercial grade. The first thing to know is this unit is pretty loud. The fan runs constantly to keep the unit cool, which is a good thing for beer quality, but not so much if you want peace and quiet (for a man cave it is probably OK, but not in a kitchen). On the dual faucet tower the faucets do not line up with the drip tray. The drips from the faucet fall directly on the top surface. The drip tray arrived scratched and I am working with Bevergae Factory to have replaced. This unit is tall. I assumed I could lower it by 4 inches by removing the casters, however the compressor in the back allows only the unit to be dropped by an inch and a half. So If you are looking to line up with a countertop top surface (at standard height) then it will not quite work. The unit does pour a good beer though. No foam, constant temperature. Comments: This is the best kegerator and I did the research. The inside is stainless all stainless outside. It has the drip tray built in it which is easy to use and clean. Also it is a fan system so if you get one the big tube goes up the tower to push cold air up. It can handle up to 4 5 gallon kegs. It is nice to have a spare for my poker night parties. Currently I use the unit outside on the patio and the beer is staying very cold. If you can spend the extra money I highly recommend this unit.